This is a totally superb bass in ” as new” condition (The only “fault” is you can see where the original factory sticker was applied to the pickguard) and comes with the original SKB hard case and all factory extras such as polishing cloth, manual, strap lead, tools, sticker and key. 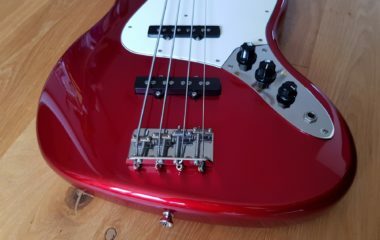 The bass is finished in deep Candy Apple Red and looks amazing and changes shade depending on the light. 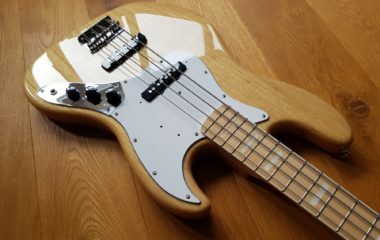 Some fretless players prefer the to play unlined basses, as I guess they are closer to the look of a double bass, but if you’re new to fretless playing then having lines makes a BIG difference. I really struggle with an unlined, but with this bass I reckon I could go out and do a gig with it if I had to, and it wouldn’t sound too bad! But seriously, if you’ve always fancied the idea of playing a fretless, this is the bass to go for.